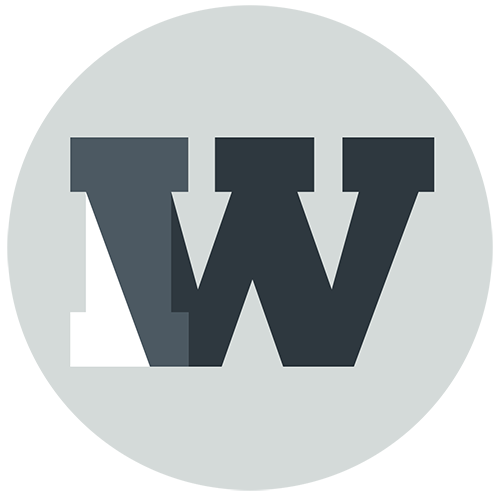 A while back I wrote something about Swafield, which you can find here. 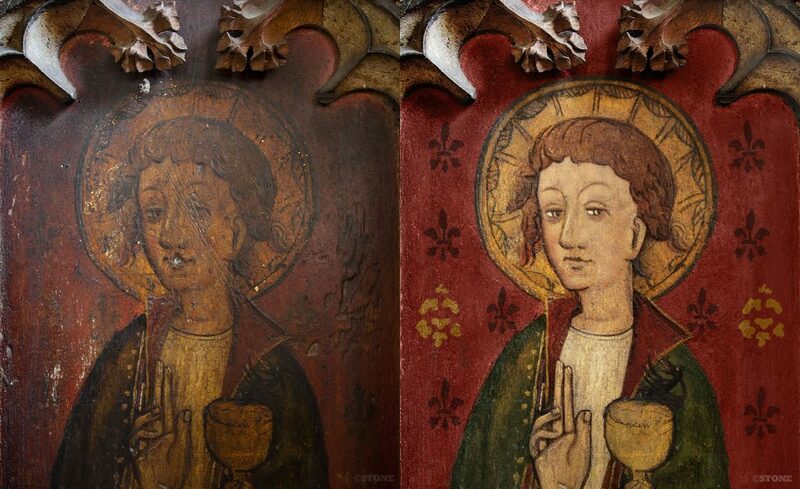 I visited it for various reasons, one of which was the rood screen which is rather lovely. This isn’t uncommon in Britain, it’s especially true of East Anglia and Norfolk. 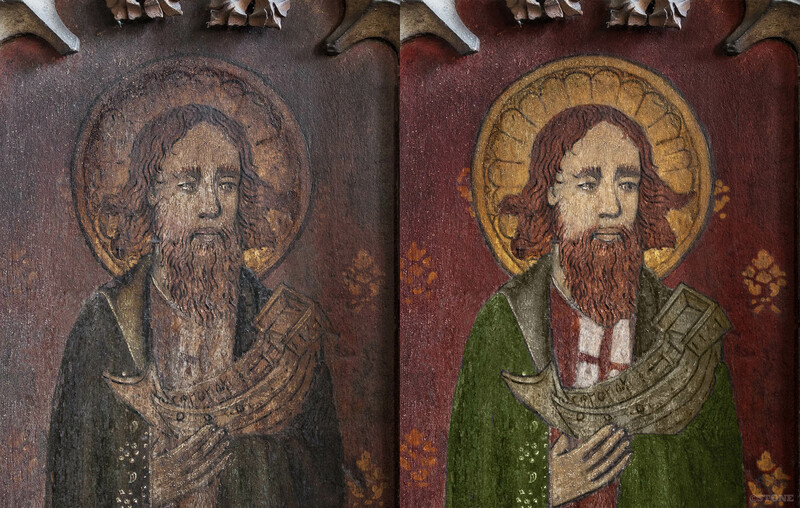 It set me wondering what they looked like when they were painted, so I took some advice from a Lucy Wrapson a medievalist and painting conservator and had a go at retouching them. 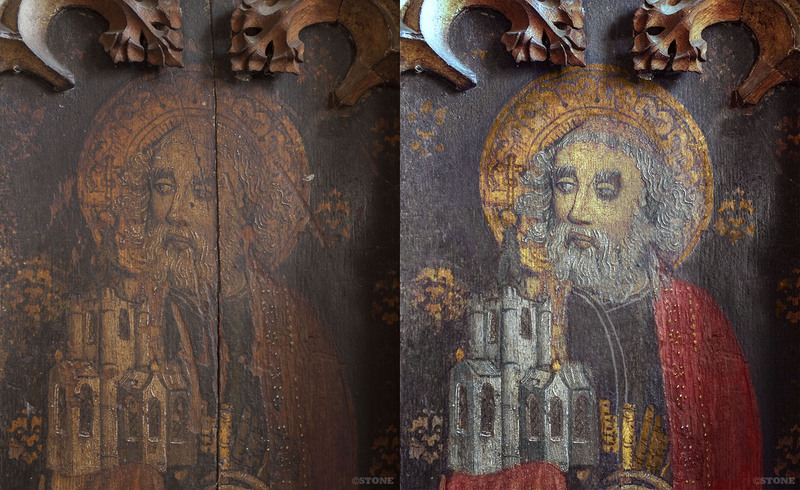 I’m evidently not the first as there’s obviously been some tinkering by a Victorian with a paintbrush who probably replaced some of the paint incorrectly in an attempt to mend the years of overcleaning. Lucy also informs me there was an attempt in the 1970s to clean a small portion of St James (not pictured) which is still visible. So in a non-destructive digital manner I had a go at some of them using software on pixels. These aren’t perfect, but they’re a reasonable simulation of how the paintings in the screen may have looked. I know I’ve got a couple of colours wrong, the background of one is way too dark and the black Fleur de Lys should actually be silver; oxidisation and other chemicals in the paint have put paid to the shine. There is also a marked predominance of some colours and a lack of others, given how ubiquitous red is it’s obviously a common and easily and cheaply made earth or rock based colour, also oxides of metals like mercury, being poisonous not being something that was obviously worried about until quite recently. Not just in paint, but those famously mad hatters, lead in pipes even now and the remnants of white lead in paint in old terraces. We were using lead in petrol until the 1980s and still sit in pools of heavy diesel smoke in city centres and along the veins of the roads that pump through the countryside. Blue and purple were obviously quite rare and expensive and in these little parochial churches something unaffordable. There’s a lot of deep cuts to the surface too, presumably acquired during the white heat of the reformation, as idolatry and perceptions of what was superstition and veneration shifted, these were attacked. Here’s a few of them, I may do some more when I have a bit more time, something I’ve been lacking for the last few months unfortunately. St Peter, complete with keys and the Kingdom of Heaven, he looks distinctly Pre-Raphelite. The background should apparently be a bright green. St John the Evangelist with his poisoned cup and the (very small) serpent he turned what must have been a stingy measure into. The Black should be silver on this chap. He’s quite cartoon-like which is nice. 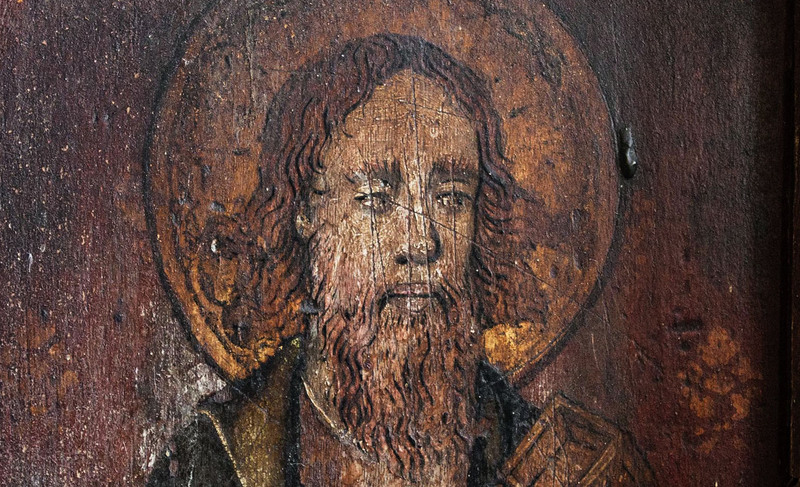 St Simon with his fishing boat.